A new rule requires all national forests to correctly map and classify their road networks. More than 45,000 features were reviewed for about 6,000 miles of road. PLTS was key to achieving cross-agency goals. Routes can be flipped to point in the right direction. In this case, the route should end on the left side of the route. At present, it appears to end at the road junction, which is incorrect. Located in southwestern New Mexico, the Gila National Forest comprises 3.3 million acres of rugged beauty, with spectacular scenery ranging from high, cool mountains with aspen and Douglas fir to warm semiarid lowlands with juniper, oak, and cactus. It is one of the more remote and least developed national forests in the Southwest and is the sixth largest in the continental United States. The forest is also home to the first designated wilderness area, the Gila Wilderness, which was established in 1924. On November 9, 2005, the U.S. Department of Agriculture Forest Service (USFS) published a new Travel Management Rule, governing off-highway vehicles (OHV) and other motor vehicle use in national forests and on grasslands. The new rule requires each national forest to designate those roads, trails, and areas open to motor vehicle use. This resulted in the need for all national forests, including Gila National Forest, to correctly map and classify their road networks. Gila National Forest Southwestern Region managers needed to update their road data in a cost-effective manner with limited labor costs. They wanted to integrate locally collected field data with existing data provided by the Geospatial Service and Technology Center, the USFS mapping center. The project would require integration of multiple data sources, compliance with regional and national GIS standards, and establishment of a regional geodatabase schema. To achieve these goals, the GIS program managers for Gila established a joint project with the Las Cruces, New Mexico, Bureau of Land Management (BLM) District Office in keeping with the USFS Service First Initiative, which allows USFS and BLM offices to combine resources to improve public land management. The initiative legally paves the way for coordinating and streamlining project implementation and costs in multiple disciplines, including GIS. 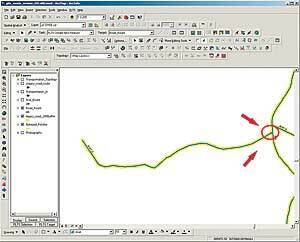 The use of domains allows the GIS user to edit and standardize a spatial layer without incurring redundancy and spelling errors. Together, the agencies selected Esri's Production Line Tool Set (PLTS) for ArcGISFoundation as the common platform for the project. 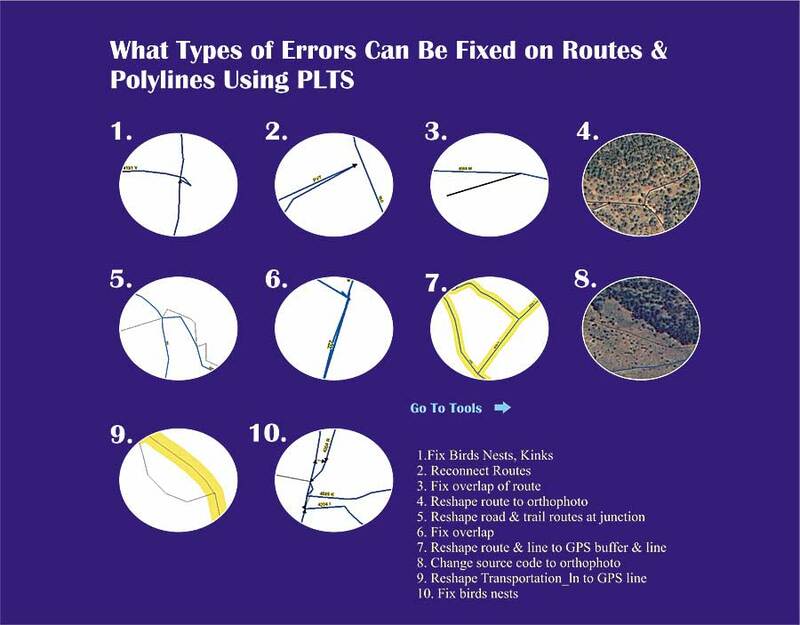 PLTS for ArcGISFoundation offered the necessary tools for editing the data within the geodatabase and for quality assurance/quality control (QA/QC), allowing them to perform maintenance of road data in an integrated fashion. The Las Cruces BLM also provided experienced student workers as affordable labor for the project. The Gila GIS Program provided the program management. One of the first steps in the project was to establish a regional geodatabase schema designed to data standards for 11 national forests between New Mexico, Arizona, and the National Grasslands in Oklahoma and Texas. This schema was designed from regional input by GIS specialists and data stewards, as well as specifications from the regional Data Automation Contract with the Tennessee Valley Authority. These specifications were later compiled into the geodatabase schema as standard values, or domains, which could be edited using PLTS for ArcGIS. Once established, all existing GIS layers for the Gila National Forest were migrated into the new schema. The main focus of the project for BLM was the editing phase. 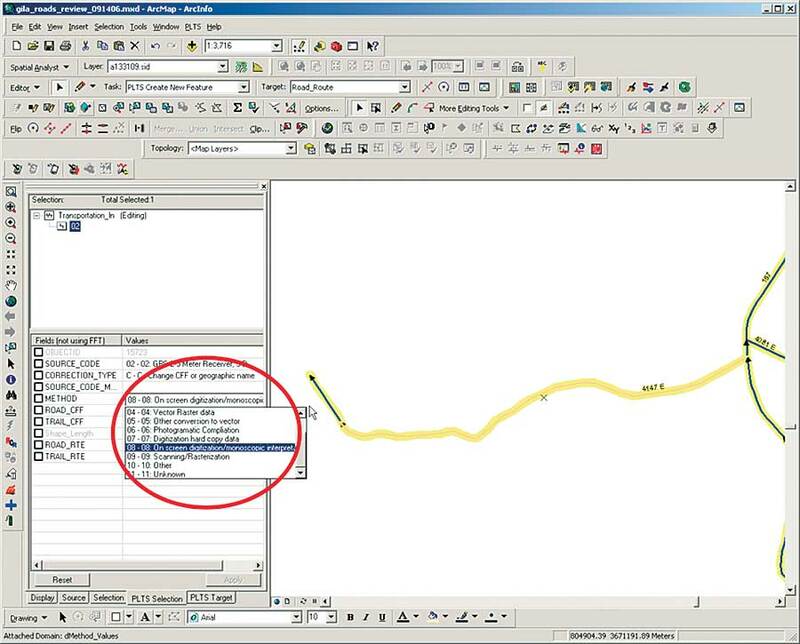 This was initiated with the assistance of Esri Professional Services, which provided a customized two-day training session of PLTS for ArcGIS, focusing on each of the features needed to edit the Gila road layer. The project then proceeded for three months in which both agencies reviewed, edited, corrected, and accepted all roads using the Foundation tools. These types of errors are typically found in a transportation layer during the editing session. One of the most important PLTS for ArcGIS tools for the project was GIS Data ReViewer, which allowed workers to identify errors, provide instructions to fix those errors, then distribute them to the GIS technician. This Foundation tool creates a personal geodatabase that tracks essential tasks within multiple error tables for the GIS technician. These tasks include spatial location of the error, the feature class requiring editing, the GIS technician user name, date, and status of the corrections and resolution. 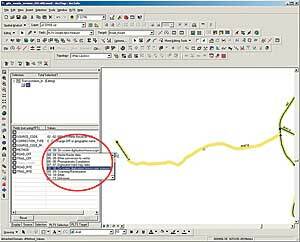 GIS Data ReViewer became an essential mode of communication between the two agencies. Since the Gila and BLM teams both had the tool, it was possible to review the edits and provide guidance when course correction was necessary to complete the project. Additionally, both agencies could share spatial bookmarks, a unique feature of PLTS for ArcGIS, which further aided the location of errors in an efficient and timely manner. Overall, this technical solution was monitored through weekly conference calls to discuss questions and resolve obstacles to keep the project on track. The magnitude of work accomplished on this project was colossal. More than 45,000 features were reviewed for about 6,000 miles of road. 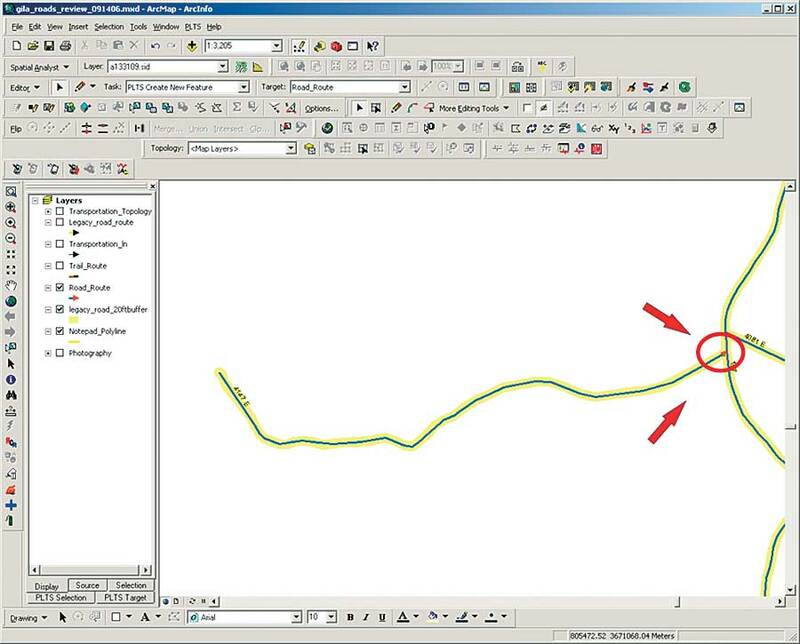 In GIS Data ReViewer, 400 roads were physically edited for both spatial location and attributes. All unsatisfactory edits were flagged as unacceptable until a satisfactory correction could be achieved. Employee performance was easily measured as the BLM GIS technician performed editing tasks on a two- to three-day rotation based on the complexity of the errors. The project was essentially paperless. Major cost centers included salary for the GIS technician and oversight provided by BLM. This project served as a showcase of the USFS Service First Initiative, demonstrating the use of PLTS for ArcGIS as an innovative template for establishing cooperation and communication between the two agencies. PLTS for ArcGIS was a key tool in achieving cross-agency goals, improving customer service, and meeting the public expectations of the two land management agencies. Joe Encinas is the GIS coordinator for the Gila National Forest in southwestern New Mexico. Phil Watts is a GIS specialist with the Bureau of Land Management Roswell Field Office in southeastern New Mexico. For more information, contact Joe Encinas, GIS coordinator, Gila National Forest (tel. : 505-388-8231); Phil Watts, Jr., GIS specialist, BLM Roswell Field Office (tel. : 505-627-0232); or Doug Cribbs, Esri (e-mail: dcribbs@esri.com; tel. : 909-793-2853, ext. 1-2439).